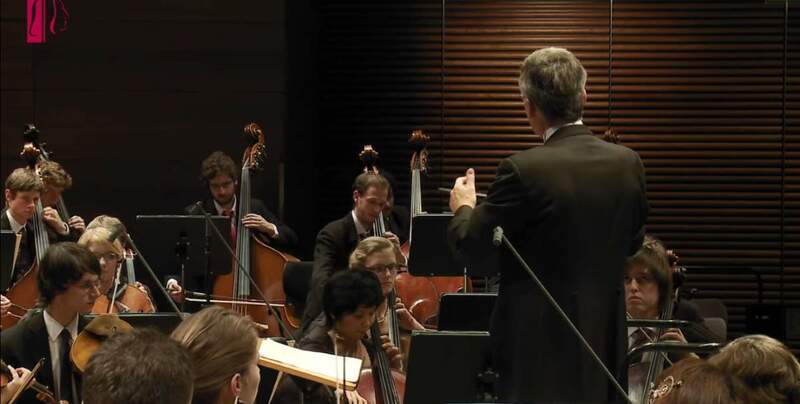 Conducted by Prof. Nicolás Pasquet, The Orchestra of the University of Music FRANZ LISZT Weimar performs Béla Bartók’s Concerto For Orchestra, Sz. 116, BB 123, a five-movement musical work for orchestra composed in 1943. It is one of the Hungarian composer’s best-known and most popular works. It is also widely considered one of the best-instrumented orchestra pieces of all times. The recording took place on December 8th, 2011 at the Weimarhalle, Weimar, Germany. “Concerto for orchestra” was composed 1943, after Bartók emigrated to the United States because of the World War II. The work is in contrast to the conventional concerto form, which features a solo instrument with orchestral accompaniment. Bartók said that he called the piece a concerto rather than a symphony because of the way each section of instruments is treated in a soloistic and virtuosic way. 00:16 Introduzione. Andante non troppo – Allegro vivace. The first movement, Introduzione, is a slow introduction of Night music type that gives way to an allegro with numerous fugato passages. This movement is in sonata-allegro form. 10:41 Presentando le coppie. Allegro scherzando. The second movement, called “Game of Pairs” (but see note below), is in five sections, each thematically distinct from each other, with a different pair of instruments playing together in each section. In each passage, a different interval separates the pair-bassoons are a minor sixth apart, oboes are in minor thirds, clarinets in minor sevenths, flutes in fifths, and muted trumpets in major seconds. The movement prominently features a side drum that taps out a rhythm at the beginning and end of the movement. 17:32 Elegia. Andante non troppo. The third movement is another slow movement, typical of Bartók’s so-called “Night music”. The movement revolves around three themes which derive primarily from the first movement. 24:50 Intermezzo interrotto. Allegretto. In this movement, the timpani is featured when the second theme is introduced, requiring 10 different pitches of the timpani over the course of 20 seconds. The general structure is “ABA-interruption-BA”. 29:06 Finale. Presto. The fifth movement, marked presto, consists of a whirling perpetuum mobile main theme competing with fugato fireworks and folk melodies. This is also in sonata-allegro form.